Viewed collectively, the form, wear, and disposition of the Gritille clay figures conform to the pattern predicted for figures used as vehicles of magic, artifacts made by individuals as part of rituals used to ensure the well-being of the maker(s). This is hardly an earthshaking conclusion, but it is based not on assumption and simple assertion but on matches between archaeological data and a set of predicted attributes based on patterns in observed human behavior. Both wear pattern and context suggest that the single heavily worn animal from a living surface was used as a toy. A dual function for figurines—magicatehicle recycled as toy—is not uncommon in the ethnographic literature, but it is also possible that the animal was made and used purely for entertainment. 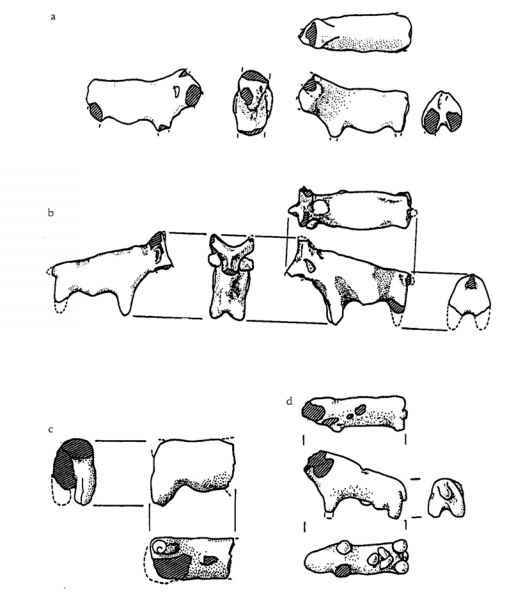 With the function of clay figurines firmly established, is it possible to use form to suggest ideas or values that might have been associated with their use?Most of the animal figures could be identified as cattle with long, curving horns (Figure 5b; Voigt 1985:Figures 10e, 11). Technical archaeological reports as well as more popular sources often state that small figures of animals represent hunting or herding magic, a desire to maintain the well-being of wild or domestic herds. This argument is particularly attractive when the animals have been stabbed with a sharp object or "killed,"as is the case with many of the animals from 'AinGhazal (see Rollefson Chapter 7, this volume). If we accept this interpretive framework, rituals employing cattle figurines at Gritille should be related to a concern with cattle fertility and food, an explanation that seems unlikely given the fact that domesticated herds of sheep and goats supplied most of the meat eaten in the village (Stein 1986,1989). The primary function of the figure is to be a symbol—theirform related them to some power or spirit; but, by definition, symbols are arbitrary. Making and/or destroying a cow figurine may be related to invocation and/or destruction of a supernatural entity associated iconically with cattle. A second aspect of context and behavior associated with these contexts can be used to argue against an equation of cattle figures and food procurement. Animal figures are found in and around features used by women: roasting or cooking surfaces at Gritille (and for pottery firing at Hajji Firuz). If women manufactured and used these artifacts, it seems unlikely that they were used in magic intended to achieve success in hunting large game, an activity rarely practiced by women in simple farming societies. Given that cattle are prominent in the symbol system of other Anatolian sites of this period (e.g., Catal Hoyuk), we can assume that the cattle figurines had a symbolic rather than literal meaning, but what this meaning was cannot presently be determined. Figure 5. Clay animal figurines from Gritille; scale 1/2. related to the well-being of females and children. One of the figures shows a skirted person with a protruding stomach and prominent navel but no breasts (Voigt 1985:Figure13a-b). When found, the stomach, which was made from a separate lump of clay, had broken away, showing that the figure was originally modeled with a flat stomach, complete with its own navel! The conditions portrayed by this figure (i.e., before and during pregnancy) seem clear enough, and since the context in which it was found (a trash pit) suggest that it was a magical figure, it may be argued that fertility or healthy children were indeed the object of the ritual act of manufacture and disposal. This is hardly surprising, given that in many premodern societies women were pregnant for most of their adult lives and may have lost half of their offspring in infancy. Another clay figure shows a seated person with crossed legs (Figure 4b;Voigt 1985:Figure 12a-b). Scars on the body indicate that this figure had something in its lap (perhaps a child?). What symbolic value the snakelike body and flat face of this figure had for its makers is again unknown, but it is one of a group of Neolithic figurines that have a phallic aspect (e.g., Mellaart 1963:Figure19,discussed below). The distinctive flat face also appears on a tiny limestone head (Figure 4a), which has holes in its flat, finished base, presumably for attachment to a body made of some organic material that has decayed. Use of an unusual material suggests a different function, for example a toy or a cult figure. The head was found in an ash deposit up against a house wall, a context that provides little help in determining function. A second stone figure portrays a very fat seated woman(?) 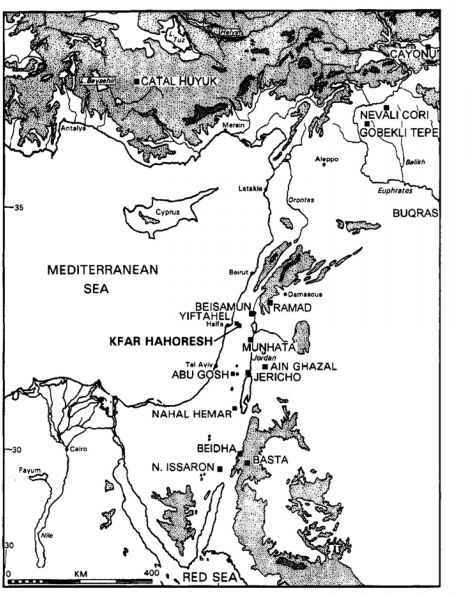 (Figure 4c;Voigt 1985:Figures 10g, 14). The globular feet of this figure have been chipped, as though they had been walked over some surface. Using our interpretive criteria, this figure fits several categories. The fact that it was made of stone and took a greater investment in labor might suggest a cult figure. On the other hand, it was found in household garbage and has wear similar to that expected on a toy. Without more examples of this type, and some kind of distribution and/or wear pattern, there can be no final answer. To summarize, nearly all of the Gritille figurines are found in contexts and in a condition that strongly indicates use as vehicles of magic. With this established, the precise chronological disposition of the figures may be significant. The figurines are found in roasting pits, but only a few of the roasting pits in the sample contain figurines, and a majority of these date to a narrow stratigraphic zone at the end of phase B, just before a break in the sequence (see Voigt 1988:219-221). Thus there may be a marked increase in rituals designed to alleviate life's problems or ensure the well-being of the community at a specific point in its history. One way to test this inference would be to look for other evidence for environmental or nutritional stress. In the absence of burials, variations in human health cannot be mea sured directly, but might be evident in animal populations. Detailed analysis of the faunal remains now being conducted by B. Monahan of Northwestern University should provide a means of assessing the meaning of the archaeological distribution of clay figures at Gritille.